In this frantic 2D couch combat game, you have one bullet to fire at your opponents. After firing your gun, you must “rebound” your bullet before firing again. This grin inducing mechanic introduces a new strategic element where thinking about where your bullet will land is as important as where you shoot! 1-2 player Co-op or 2-4 player Versus mode. This is a game that begs to be played together with friends and family. Enjoy the playful style with 7 game modes and 6 stackable gameplay modifiers. Want to tryout jetpacks and then turn everyone invisible? Go for it! Select from 10 Player costumes to start with an additional 35+ wacky costumes to unlock during your quest to protect the galaxy! 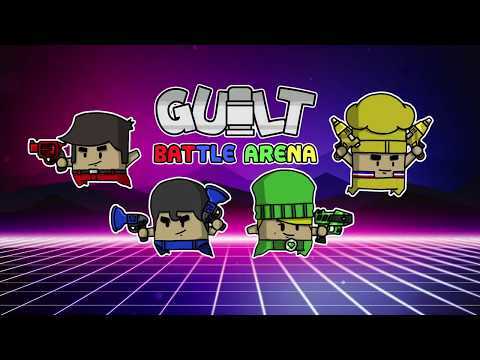 Guilt Battle Arena was released on Xbox One 435d ago in the US and the UK. Based on 2 Guilt Battle Arena Xbox One reviews, Guilt Battle Arena gets an average Xbox One review score of 46. The score for all versions is 50 based on a total of 9 reviews. By all means check it out if you can grab it in a sale and have some mates over for a night of fun and games, but otherwise Guilt Bullet Arena misses the mark. Guilt Battle Arena is a game that’s overpriced and under-delivers.